Two component, aliphatic polyurethane based, water soluble and odorless matte varnish. The varnish presents exceptional hardness, high abrasion resistance and very strong adhesion. It ensures long service life and durability against ultraviolet (UV) radiation. It does not yellow, even when several years have passed from its application. Ideal when using it in confined spaces which are not adequately ventilated, but also where the use of solvent based products is not desirable. Its application will preserve the colors and shades of the surfaces it is used on. 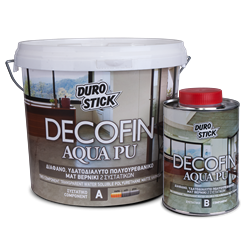 Suitable for the protection of microcemento (decorative pressed cement screeds), pressed screeds in paste form and natural stones. On cementitious floors, it creates an invisible film that protects from wear, abrasion, staining, and dusting. Classified as product for surface protection for concrete surfaces, per EN 1504-2. For screeds in paste form: 1kg/8-10m² for 2 coats. For microcemento (pressed cement screeds): 1kg/5-7m2 per coat. For natural stone: 1kg/7-8m2 per coat. Depending on their absorbency, on properly prepared surfaces.